It's a tough time to be launching a new truck. It’s not that Dodge is blissfully unaware that something is amiss in the category, they are just resolute that the new 2009 Dodge Ram will be a big winner. After all, they've made sure to deliver some self-appointed “best-in-classâ€ titles in the co-efficient of drag (.419 with a crew cab, 4x4 trim and largest engine), and 0-60 time (under six seconds with the RT). They also spent a year focused solely on customer research, discovering that the Ram needed fuel economy increases (even back in 2004), a crew cab option, more interior refinement and a much improved ride quality. Done, done, done and done. What we're left with is the best-looking Dodge Ram ever, inside and out, without any compromises to its extreme functionality. And to combat economic issues, pricing is actually down from the 2008 model, and with added content, Dodge estimates a $2,800 value improvement overall. That might buy a couple of gallons of gas, don't ya think? A new coil-spring, five-link rear suspension drastically alters the cornering capabilities of the Ram, making turns more solid and softening bumps. Your coffee will remain firmly in its cup holder now. We doubt you could fill the 42 storage bins found throughout the cabin and the optional RamBox in the bed. The smaller V-6 engine feels somewhat inadequate on hills and during passing situations and, frankly, doesn't have enough of an improvement from the larger TK engine in fuel economy to make up for it. Rear legroom in the quad cab is three inches less than the crew cab and can be tight for taller passengers. The drive experience is very much defined by what's under the hood. The 3.7-liter V-6 may be underpowered in certain situations, but if hauling isn't your main priority, then this should be all you’ll need. Steering is on the light side and there's a fair amount of body roll around corners, but the drive is close to car-like smooth and the cabin is whisper quiet. The 4.7-liter V-8 engine ups the Ram’s game with more horsepower and torque to net a 2-3,000-pound increase in towing capacity. With the 5.7-liter V-8 HEMI, you can really feel the tug of the engine. Towing an Airstream, as we got to do, is a piece of cake. The steering is heavier and more direct, and the Ram felt good and grounded. Many trucks ride over the road, giving you a disconnected feeling – not so with the Ram. With individually tunable springs, the all-new suspension that replaces the leaf spring system – a first in its class – dulls road irregularities better than any rig we've laid our hands on. All trims cut through the air more easily than the previous model and the five-speed automatic transmission shifts quickly and smoothly. This is not your grandfather’s old Mopar truck, that's for sure. A Ram buyer would be remiss if they didn't tick the RamBox option, which breaks down into four parts. First, it adds two side cargo bins above the rear wheel wells that can hold, just for example, 120 12-ounce cans in each. Everything from full golf bags to wet gear you don't want to store in the cab can fit in the well-lit 7.4 cubic feet of space. More storage can be found in the under-floor bins in the cabin – another part of the Rambox special. The package also includes an adjustable bed divider that doubles as a two-foot bed extender. Audio and navigation functions are filtered through the MyGig infotainment center. The system can be controlled via touch screen or voice commands and has Bluetooth capability to make hands-free calling a straightforward process. Navigation also includes real-time traffic, and an optional Sirius Backseat TV lets passengers watch over 130 channels while stuck in traffic. Check all the tech and luxury options and your Ram becomes a limo with a longbed. Things could be better, but Dodge has made serious attempts to give these traditionally gas gulping engines more of an eco-consciousness feel. With various adjustments, the HEMI receives a gain of 4 percent in fuel-economy to 14 mpg city, 20 mpg highway with 2WD and 14 mpg, 18 mpg in AWD. The 4.7-liter gets 14 mpg city, 19 mpg highway in two-wheel driver and 14 mpg, 18 mpg with the AWD. It is also compatible with E85. The smallest engine naturally sees the best mileage with 14 mpg city and 20 mpg highway. A hybrid version will debut sometime in the next year, utilizing the same two-mode system used in the 2009 Dodge Durango Hybrid. An improved interior space was on the wish list of most Ram owners, which means 2009 marks an era of upscale cabins for this Dodge. Even on the base model, the passenger space is more luxurious than previous models, and high-end trims feature options like touch screen infotainment centers, heated (both front and rear) and cooled front seats and leather and wood applications. Dodge realizes they have an iconic image to work with and thusly avoided drastically messing with the exterior design. Most changes directly corresponded to improving aerodynamics, like lowering the windshield wipers, adding the rear spoiler lip and lowering the side sills to cover the Ram's frame. 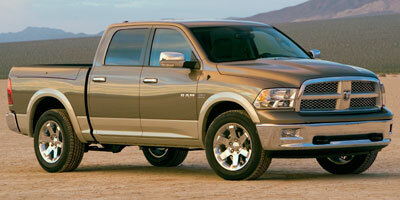 The Ram badge has been made even larger, and the grille, now in the shadow of the rig’s nose, is even more aggressive. The Rams all ride on either 17- or 20-inch wheels as well. With three cab types as well as two-wheel drive versus four-wheel drive options and five model trims (ST, SLT, Sport, TRX and Laramie), pricing might take up this entire review. We're sticking to the basics for now. The Dodge Ram starts at $22,170 for the regular cab, $26,225 for the quad cab and $32,530 for the Ram Crew 1500 with the $900 destination charge included in the price. The stiff competition’s 2008 models include the $18,515 Chevrolet Silverado, $22,390 Toyota Tundra, $25,330 Nissan Titan and $17,700 Ford F-150. As far as trucks go, the Ram consistently delivers more than what is asked of it. The rough-and-tumble styling includes fuel-saving aerodynamics, the options are even more plentiful and the accentuated drive quality is beyond compare in the current marketplace. Once just a work truck, Dodge has expanded functionality to supply those who need a rig to shop for new backpacks and pencils, as well as for those who actually need to tow that fishing boat. No matter what gas prices look like, some people just want and need a good truck. The Ram is that truck.